President Gordon B. Hinckley (1910-2008) was called to the Quorum of Twelve in 1961. 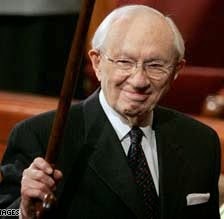 He served as a counselor in the First Presidency from 1981-1995, then as Church President until his death in 2008. 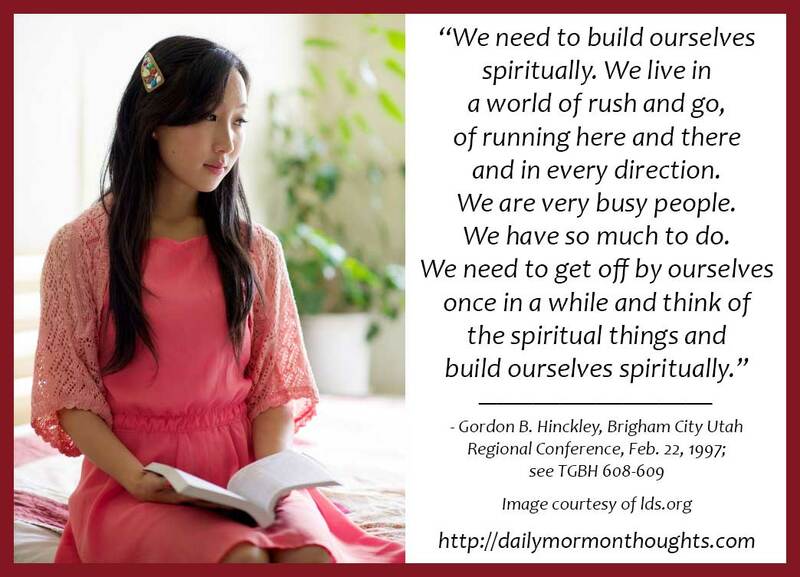 "We need to build ourselves spiritually. We live in a world of rush and go, of running here and there and in every direction. We are very busy people. We have so much to do. 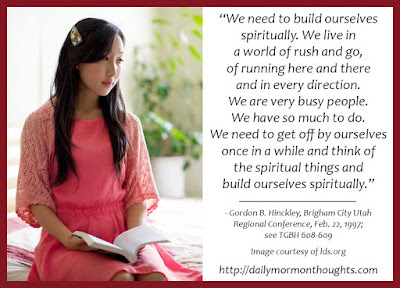 We need to get off by ourselves once in a while and think of the spiritual things and build ourselves spiritually. If you have a study at home, lock yourself in it. If you have a place in the basement where you can be by yourself, go there. Get by yourself and think of things of the Lord, of things of the Spirit. Think of all the Lord has done for you. How blessed you are, how very blessed you are. Think of your duty and your responsibility. Think of your testimony. Think of the things of God. Just meditate and reflect for an hour about yourself and your relationship to your Heavenly Father and your Redeemer. It will do something for you." One of President Hinckley's key suggestions is to have a place where we can "get away" from the interruptions and pressures and be alone. The temptation in our day is to take our communication devices (phones, computers) with us to those places, rationalizing that since no other people are physically present, we are alone. But that is not the intent of President Hinckley's advice. The key is to have time to focus on the Lord and on the "things of the Spirit." It's a time to ponder blessings, to review responsibilities, to consider testimony. How often do we truly "meditate and reflect for an hour about yourself and your relationship to your Heavenly Father and your Redeemer"?? In doing so, we truly will be blessed.